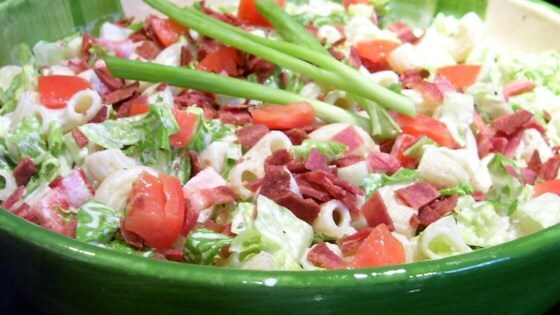 "This is an easy but flavorful pasta salad that I'm always asked to bring to potlucks. With chunks of onion, tomato, and bacon, smothered in Ranch dressing, it is full of flavor! This salad tastes best if made several hours ahead of time." From the ingredients, I thought I would have loved this but I really didn't care for it at all. Neither did anyone at the family reunion. Wont be making this again. Very good recipe! I added chopped celery and pre-chopped the bacon before frying it. Also, the Kraft Ranch with bacon dressing tastes great for this recipe!